You will need to register before using this service for the first time. After you register, at some point you will receive a call from the Surgery to verify your request. You can also drop in your repeat medication request slip over the counter at any of our surgeries, or order through your local pharmacy. 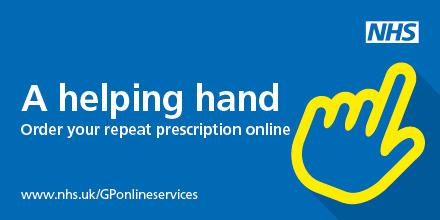 The prescription telephone request service has now ceased. Please allow 48 hours if collecting from the surgery, 72 hours if collecting from a pharmacy, excluding weekends and Bank Holidays, for your request to be processed. Any problems please telephone the surgery after 11.00am. Please visit this link for a list of all pharmacies opening times over Easter 2019.